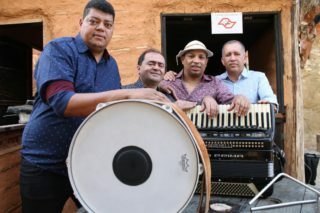 In 1999 Zezinho started his forró project on the sidewalk and in this project he met Piaba, Japinha and Berinjela, was when the idea came to form a band that did not yet had a name. They received an invitation from a Santo André production company for the first presentation at a large concert hall, and for the disclosure they would need a name and had the great idea: “Os 4 Mensageiros“. With this training the invitations to the renamed concert halls were appearing, playing in some as “Remelexo Brasil”, “Canto da Ema”, “Estancia Alto da Serra”, “KVA”, “Danado de Bom”, among others. In 2004 they were able to participate in the biggest Brazil pé-de-serra festival (FENFIT) getting the 2nd place and Piaba winning the prize as best interpreter. In 2005 they became the great revelation of the pé-de-serra scenario with the first CD (Tá no ponto), then starting a tour in Brazil. Growing steadily in the complicated forró pé-de-serra market, they launched the second CD (140 per hour), besides their charisma that conquers everyone, this set of factors makes Os 4 Mensageiros never give up showing the public all the effort and work they had to get to where they are now. Os 4 Mensageiros today have a project to continue carrying joy, charisma and good music and thus take the pé-de-serra to the whole world. um rootstock fora de época. The Forró de Domingo Festival is known to have the most fascinating forró teachers and focuses on delivering top quality classes. In 4 days you will have the unique opportunity to learn new moves and to develop your dance techniques with the world’s greatest forró teachers. Music is embedded into the festival and it magic makes two into one while we are dancing! Don’t be uninformed. Get the latest update from our Blog.